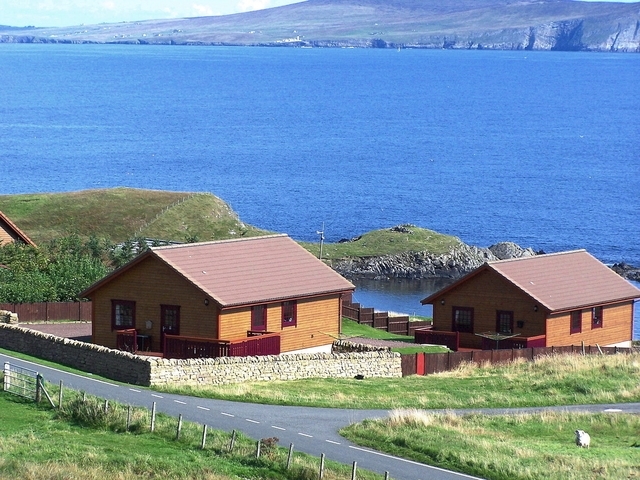 Glover Lodges, "Oxna" and "Papa", are newly built luxury Scandinavian lodges situated in a scenic coastal area on the South Mainland of Shetland. A relaxing and peaceful place, ideal for hill and coastal walks, bird watching, sea and trout fishing. The shore is habitat to seals, porpoises and otters and there are several pebble beaches. Excellent seaviews over the Bay of Ocraquoy below and towards Lerwick and the islands of Bressay & Noss. This is a superb base for exploring the rest of Shetland, situated close to the main bus route, and only 10 minutes drive to Shetland's capital, Lerwick. Cunningsburgh village is a 5 minute walk away with a shop, hall, pier and marina. Further down the coast is the village of Sandwick which has a shop, social club, public house, a modern swimming pool, visitor centre and cafe and also ferry transport across to the island of Mousa. Two luxury lodges built and furnished to the very highest standards and set in the most stunning coastal location. - One double and one twin bedroom in each lodge. TV in double bedroom. - Spacious open-plan living/dining room with large sofas; flatscreen Digital TV; DVD; Video and Hifi system. Excellent seaviews. - Large fully-fitted kitchen with all mod cons including dishwasher and washing machine. - Bathroom has fitted units and bath with power shower. - Spacious garden area and ample parking. - Open throughout the year. - Sleeps a maximum of 4 people.